If you are a personal trainer interested in expanding your training options to the water, it is important to learn about the aquatic environment. The water's viscosity provides resistance that surrounds you and provides "work" for every movement in every direction. The water's buoyancy reduces body mass, impact to weight bearing joints, and spinal decompression in deep water. The water's hydrostatic pressure affects many of the body's physiological functions. If you want to be an effective aquatic personal trainer, learn about the special benefits and qualities the aquatic environment has to offer and incorporate that knowledge into your personal training sessions. This course will start you on your way to becoming a successful aquatic personal trainer. Know basic requirements for personal training in the aquatic environment. Discover opportunities for aquatic personal training. Understand the effects of water immersion on human anatomy and physiology. Be able to effectively train in the aquatic environment with proper knowledge of aquatic exercise environmental factors including water temperature, humidity and air temperature, water quality, air quality, pool considerations, and acoustical factors. Know basic dress for aquatic exercise and personal training. Understand basic properties of the water including viscosity, buoyancy, heat dissipation, hydrostatic pressure, and surface tension. Have a general knowledge of basic aquatic training formats including shallow water, deep water, transitional water, and mixed formats. Learn and review American College of Sports Medicine (ACSM) workout component guidelines with considerations and adaptations for the aquatic environment. 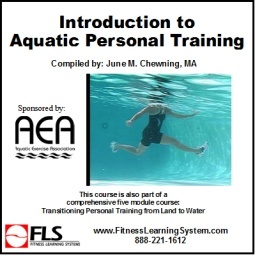 See sample work outs for personal training in the aquatic environment. Learn recognition of a water crisis and basic assist/rescue skills for the aquatic environment.